Here comes the 5th look! 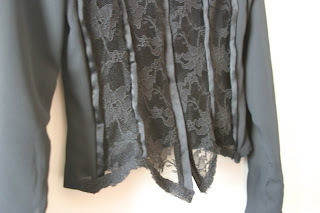 Long sleeved victorian shirt with lace panels on the front. Collar in satin. If you look closer, you will see satin seams between the lace panels. It is meant to create the effect of a cobweb. 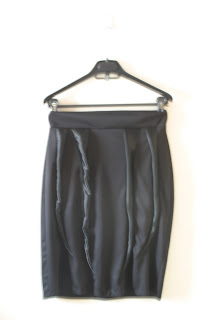 The pencil, high-waisted skirt has sating "legs" that stand out from the surface. 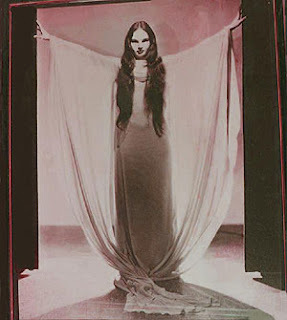 The following list is been written by Christine Stoddard, writer and artist from The States, whose work has appeared in numerous publications both print and online. 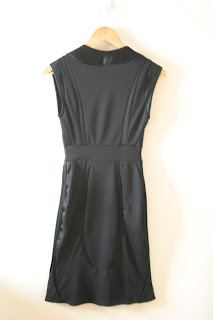 "Wear black the right way: In small quantities, black is stunning. In large quantities, black is morbidly unattractive. 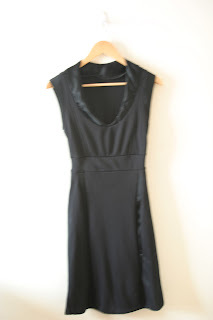 You can achieve the slimming effect black brings without shrouding yourself in all-black outfits. Pair black with navy, forest green, dark brown, deep violet, charcoal gray, burgundy and similar drab colors or use them as complete alternatives to black. 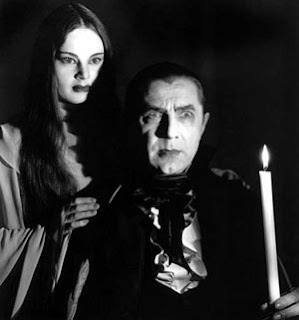 Also remember that black and scarlet or black and purple are two popular Goth color combinations". "Wear silver jewelry: Silver charm necklaces and bracelets are popular Goth accessories. 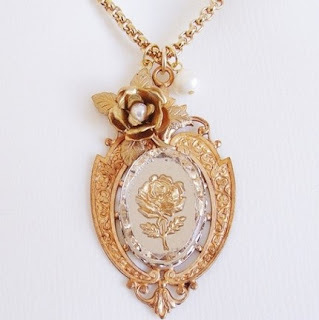 Look for charms like lockets, birdcages, crosses, skulls, suns, moons, stars, owls, unicorns, and fairies. Avoid bright gold-colored jewelry. Faded gold jewelry looks best if paired with silver pieces. Try putting some lightweight faded gold and silver chains together with a scoop neck or V-neck blouse. Silver chandelier earrings with beads are also classically Goth. Just remember, that the dressier the jewelry, the subtler the clothes should be, at least for day". "Wear textured hosiery: Hosiery can make an outfit. For a sophisticated Goth look, go for fine fishnets in black, charcoal, chocolate, burgundy, and forest green. Avoid fishnets with giant holes, as they reveal too much flesh in an unflattering way. (If you’re aiming to show off a little skin, better unbutton your blouse for some cleavage instead or simply go barelegged.) Pair textured hosiery with plain skirts and dresses---no competing textures or patterns, like reflective silk or floral. Opaque tights in black and interesting shades of wine and plum are good for more intricate dresses and skirts". I would also like to add that if you are going for the plain-black look, a pair of lace tights will not only add the gothic bit to it but it would make it look very very elegant without looking too-dressy. Another colour that would really suits the gothic skin-types is cream. It´s a very romantic colour that works very well with black, adding a softness to the somehow harsh black and it emphasizes the pallor of white skins. "Wear dark velvet: Everything-even lounge pants-looks elegant in velvet. But as tempting as it may be to drape yourself all over in this comfortable fabric, try to add variety to an outfit by mixing in other materials. Wear a velvet hoodie over a cotton tee or a velvet skirt with a fitted wool sweater. Also search for jeans with velvet details, like velvet embellished embroidery or velvet covered pockets. 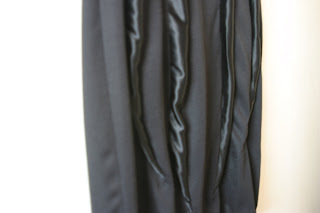 If real velvet is too expensive for your budget, search for polyester or rayon textured like velvet. They give the same effect for far less money and most people cannot even distinguish between the two". My tip is, avoid velvet unless the piece is plain. Because it´s a very luxurious and shiny fabric, you would end up looking too dressy with it and the Gothic look is VERY easy to overdue. If you still want to wear velvet in your outfit, use a key piece for it (a burgundy or black blazer, a skirt or a top). "Wear lace: Lace is the most feminine of fabrics, which is why it’s so hard to wear well without seeming like you’re in a period piece. 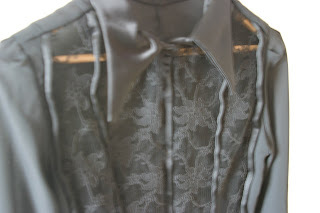 The key is to mix lace with more gender-neutral or even masculine fabrics to offset its inherent flounce. That’s why black leather and lace are such a classic combination. Another idea is throwing a casual fitted cardigan over a lace-trimmed camisole (or two or three layered camisoles). Black or burgundy lace trim is also a classy trim for jeans and denim jackets. Lace chokers are graceful touches to any outfit, but to avoid looking too dressed up during the day, throw on some jeans or a casual top. Also shop for lace headbands for girly panache". "Wear pearls: Pearl necklaces, long or short, are classy additions to any outfit. Pearl bracelets look very Victorian, but for a modern touch, stack them up with short-sleeved or sleeveless tops. Also search for buttons and jackets with pearl buttons. Be careful when shopping for peal earrings---they can easily look too matronly. Tiny pearl studs are usually the freshest, most modern size. Small pearl drop earrings are also lovely. 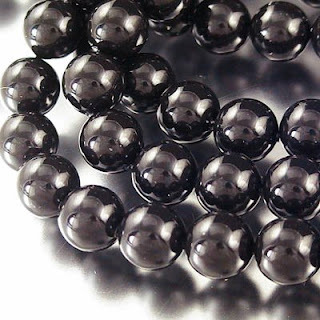 Look for pieces in black pearls, too, which are gorgeously Goth when paired with black lace". Don´t look for pearl buttons! Just thinking of it, eeeeeegk!, it would make the piece look SO old fashion, but in the bad way! I would prefer to see pearls only on jewellery. "Wear tall boots: boots don’t have to be high-heeled, but they should cover the majority of the calf. Look for leather or suede or convincing vinyl and details like laces and subtle buckles. Black, gray, brown, red, and purple are the ideal colors, especially in darker shades. Find sleek cuts and steer clear of anything that screams ‘high school punk rock concert,’ like mega-platforms". My tip is, wear any shoes you want. Pointed, rounded, modern, old fashion (eg, Mary Janes) as long as you feel comfortable with them. But remember! Don´t over-do, if you´re going for astonishing shoes, keep the rest of the outfit plain or with minimal expression. Here it comes the fourth look! 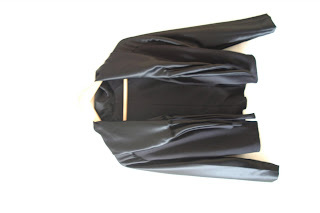 It´s a jersey jacket with a high-waisted pencil skirt. 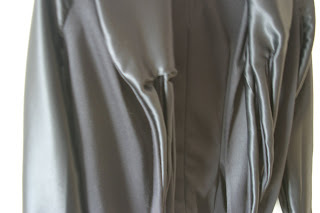 The interesting bit is, if you look carefully at the pictures, you will see that the ends of the satin collar are twisted in such a way that they create the optical effect of pointed spider legs. Tricky, isn´t! 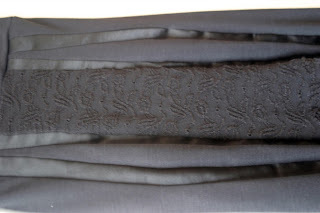 The skirt is also interesting, the main panel on the middle is jersey lace and on the sides there are satin pieces that look like spider legs! I do apologize for the bad qualities of the pictures, as soon as I got a spare moment I will take a proper picture of every single of my looks. 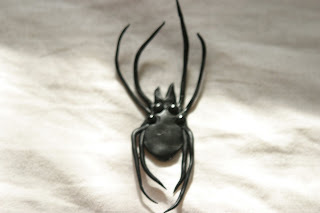 Do you remember my fimo spiders? Well, I made some more but with crystals on them. 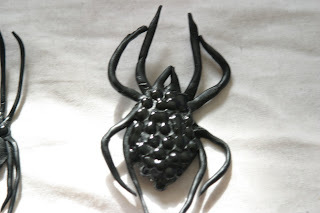 This time I applied them before putting the spider inside the oven and they obviously melted (as I would had predicted) but they did it in such a beautiful way! They look like little P.V.C. buttons. I will definitely carry on with more experiments and I will start selling them online, this summer. The 3rd look had been finished ages ago but I couldn´t post it because my computer doesn´t seem to recognize my mobile anymore. Therefore, I had to take new pictures with a digital camera so I could transfer them to the computer. Enjoy your browsing. I know I am a pain on the arse and a bit too obsessed with my first look but, I truly believe this pictures do more justice to my look. What the hell is Corporate Goth? This is something new I´ve recently discovered: corporate Goth. What the hell is that? Well, I´ve already discussed on my blog the "problems" or "inconveniences" of dressing Goth during the day (people staring at you, shouting at you, having your dress full of dogshit because is too long, pvc fabric is too hot for doing jogging...etc). So, some people (from the other side of the Atlantic) started to wonder, what to wear for work? 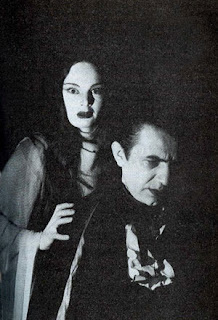 And there´s a website set-up as a forum-guide for all those Goth-workers who are in fashion troubles or just having the very first morning trauma of "I can´t see it what´s in the wardrobe, all is black!" followed after the one of "I don´t like anything from that black stain inside my wardrobe". 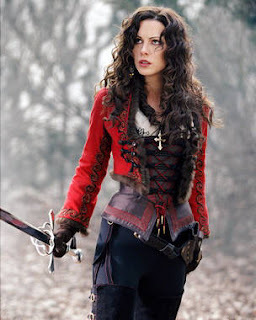 I still don´t find any shop that offers corporate gothic clothes yet.